Fancy a sneak peek into the wonderful bathrooms of celebrities? Well of course you do, who doesn't? Here we take a look into the bathrooms of the rich and famous and share a few tips on how you can emulate these in your own home and create a celebrity style bathroom. Bathrooms are often seen as the sanctuary of a house and are made to feel luxurious and relaxing, but when it comes to celebrities, that luxury can exceed even our wildest dreams. Superstar singer Jason Derulo recently revealed he even has cocktail-making facilities in the bathrooms of his 9 bedroom mansion! So with this extravagance in mind, let's take a peek into some celebrity bathrooms. 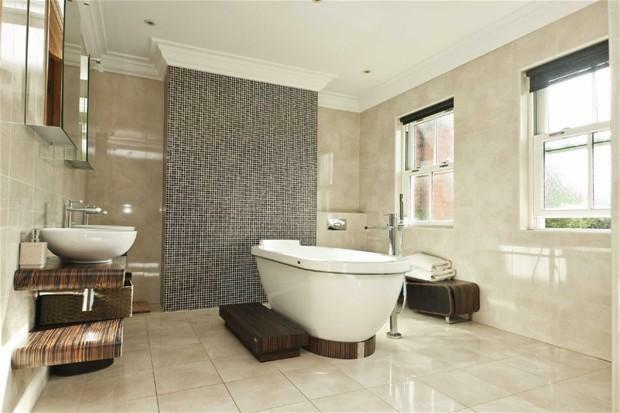 Premier League footballer Jermaine Defoe has made this gorgeous freestanding bath the main feature in his bathroom, by placing it in the middle of the room. Using the two windows and mirrors on the opposite walls gives the room it’s wonderfully light and airy feel. Freestanding baths are the perfect way to add style and luxury to your bathroom, but if you don’t have a huge bathroom like Jermaine they work perfectly placed up to the wall too. The Shakespeare Roll Top Bath with Ball Feet is the perfect freestanding bath for you to buy and add to your bathroom, and what's even better, you don’t need a footballer's wage to buy one! 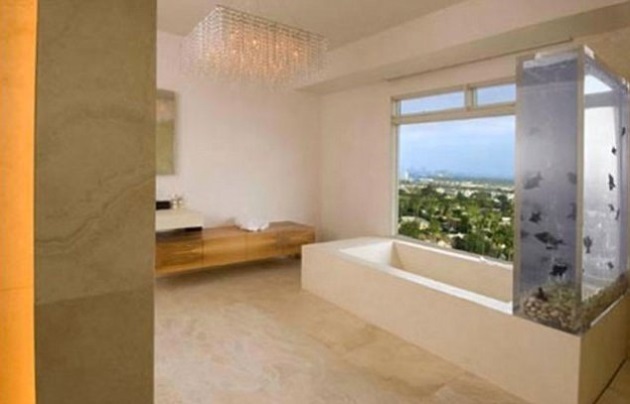 Transformers director, Michael Bay has a huge glass enclosure to house the freestanding concrete bath and unique shower in his bathroom. The gorgeous duck egg blue and grey colours really add to that spa-like feel, and both work brilliantly with the natural materials used. Wet rooms are a perfect way to reproduce this look, and you don't need a very large space to achieve this. Adding a large shower head like the Stratus Ceiling Shower Head will finish this stylish look. Singer/songwriter John Legend, has combined light walnut storage and wall panels with grey tiles to create this contemporary bathroom. His spacious modern bathroom also features a walk in shower. Walnut effect furniture is a great addition to any bathroom, it’s also a really simple way to update your room without too much disturbance and cost. Grey is a trend that is working really well in bathrooms at the moment. If you want to use grey in your bathroom, like John, but don’t know how check out our grey bathroom ideas blog. Ex-Spice Girl Victoria and her football legend hubby David Beckham, have stuck to a traditional style bathroom in their house, with his and hers basins, white storage and built-in bath. 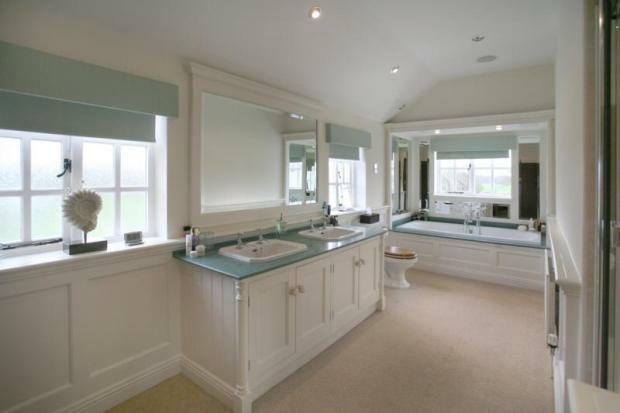 Traditional bathrooms are simple to create and will always stay on trend in any bathroom. Using white as your main colour and adding accents of other colours works perfectly. Lve him or loathe him, singer Kanye West, has of course gone to the extremes with his bathroom (would you honestly expect anything less?) and has a giant fish tank next to his bath and a huge window showing off this gorgeous view. He is another celebrity who has used wood and natural coloured materials. Using natural colours like Kanye has, is a very simple way to enhance the space you have, making it light and giving it a spacious feel. Also this trend is one that's likely never to go out of fashion. Which celebrity bathroom do you love? It's the on-trend colour of the moment... We have plenty of grey bathroom ideas that'll help spice up your interiors. Sharing a bathroom with a partner or loved one can often be stressful. If you can't afford separate bathrooms, we take a look at some ideas that may help.